Our experience in agricultural and food security projects in southern countries is the basis on which we operate in Spain around the social and urban agriculture. Such actions endow more value to the activity developed textile recovery, providing solutions to other problems in our society. Therefore, it is the perfect complement to our work on the protection of the environment. Cultivate Climate and Community 3C project promotes respect for our environment through organic farming, obtaining products for own consumption; and activists involved besides wanting closer ties with others in your community. In order to give visibility to the work of the Foundation in this area, we have the photographic exhibition "Social farming: planting future alternatives". The exhibition will tour this year several towns and cities across Spain, makes an tour of five of the projects that Humana has supported. 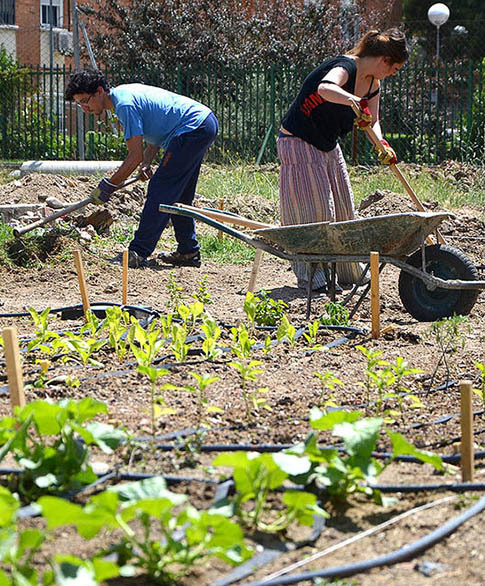 You have more information about Humana and its activity in Social Farming in the study of the Universidad Autónoma de Barcelona and the Foundation CEDRICAT this activity in Catalonia.